The Compulsive Reader: Cover Talk: Summer Love! All right, before we go any further, you all know about my love for Terra Elan McVoy's books, right? Her first book, Pure (my review is here), was so good and thoughtful and important, no matter what your beliefs are. And her second, After the Kiss , was amazingly insightful and emotion-packed...I couldn't put it down (read my review here). 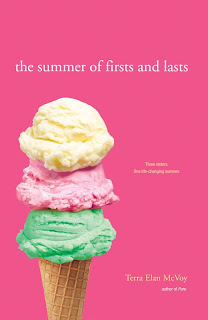 So naturally, I have been eager to see McVoy will come out with next...and here it is, The Summer of Firsts and Lasts ! Yes, yes, yes! I love the sweet, girly theme that her covers have! And the three scoops of ice cream ties in with the fact that this is about three sisters (a theme I love, especially after reading Robin Benway's The Extraordinary Secrets of April, May, and June . And especially since I am the only girl smack in the middle of four brothers). Also, how about that title? It tells you so much. Read on to learn more! "Three sisters. One life-changing summer. Calla loves summer because summer means Duncan. They’ve been best friends for years, but Calla has never worked up the nerve to tell him how she really feels. This summer, the summer before college, is Calla's last chance. Violet isn't much of a rule breaker in real life. But this isn't real life, this is summer, and Violet is determined to make the most of it. Besides, a little sneaking out never hurt anyone. And sneaking out with James is 100% worth the risk...even though James is completely off-limits. Daisy has never been the sister that boys notice, but when sparks fly with Joel at the first bonfire of summer, it seems so easy and right. So why is being his girlfriend so complicated?" All right, so what do you all think, about the cover and the book? And if you haven't read McVoy's books, you need to do so straight away! I don't know what else to say to you...except that you won't regret it! This one will hit shelves on May 3rd, 2011, just in time for summer! Yay! It looks like there will be a lot of awesome new books coming out next spring, just in time to take with you to the beach and on all of those summer road trips...like new books from Sarah Dessen , Deb Caletti , Elizabeth Scott , Susane Colasanti , and of course, the final book in Jenny Han's ah-mazing trilogy, We'll Always Have Summer ! I am so ready for Summer 2011!